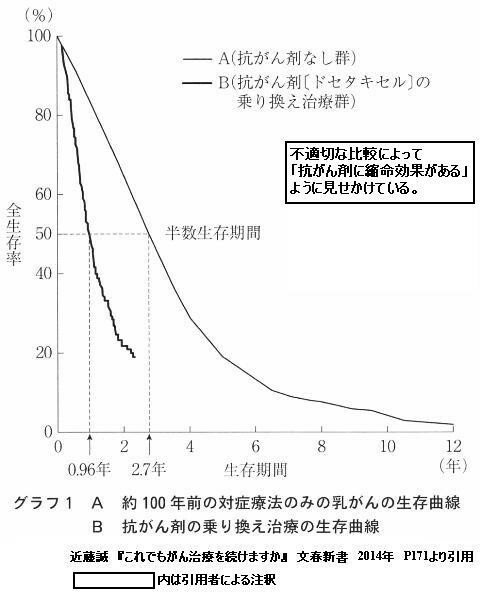 A.（抗がん剤なし群）→Bloom HJ et al., Natural history of untreated breast cancer (1805-1933). Comparison of untreated and treated cases according to histological grade of malignancy. Br Med J. 1962 Jul 28;2(5299):213-21. B.（抗がん剤多剤併用群）→Greenberg PA et al., Long-term follow-up of patients with complete remission following combination chemotherapy for metastatic breast cancer. J Clin Oncol. 1996 Aug;14(8):2197-205. 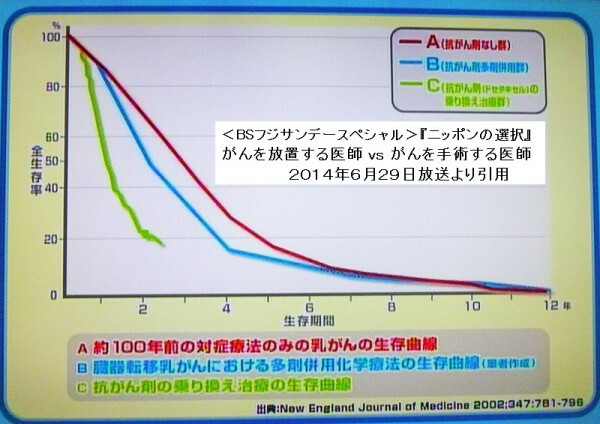 C.（抗がん剤（ドセタキセル）の乗り換え治療群）→O'Shaughnessy J et al., Superior survival with capecitabine plus docetaxel combination therapy in anthracycline-pretreated patients with advanced breast cancer: phase III trial results. J Clin Oncol. 2002 Jun 15;20(12):2812-23.